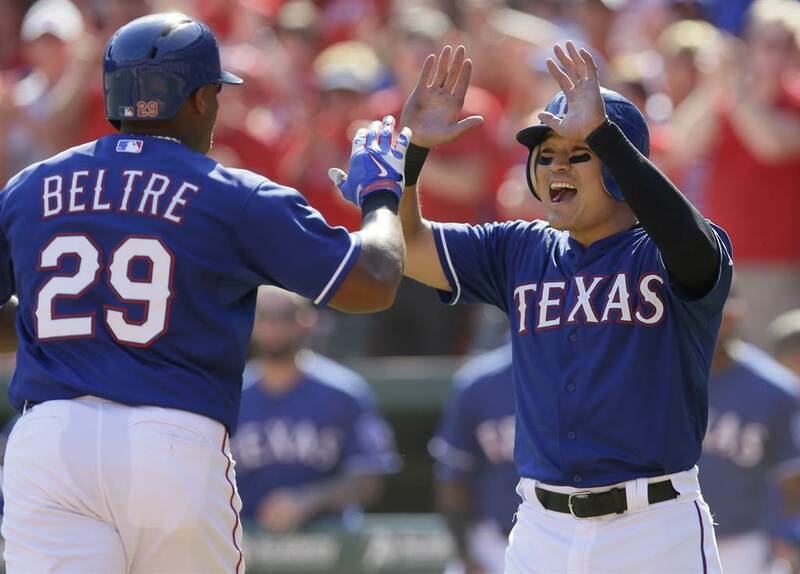 ARLINGTON, Texas, Oct. 4 (Yonhap) — Choo Shin-soo of the Texas Rangers enjoyed his first division crown Sunday, as the Rangers defeated the Los Angeles Angels 9-2 at home on the final day of the Major League Baseball (MLB) regular season. The Rangers (88-74) clinched the American League West title, and will meet the Toronto Blue Jays, the AL East champ, in the AL Division Series, starting Thursday. The first two games will be at Rogers Centre in Toronto, while Games 3 and, if necessary, 4 will be at Globe Life Park in Arlington. Choo went 1-for-3 with two walks and two runs scored, as the Rangers got out of their late season funk just in time. With the Rangers down 2-1, Choo hit a one-out infield single in the fifth and scored on a go-ahead, two-run home run by Adrian Beltre. The Rangers were nursing a 3-2 lead in the seventh with two on, and Choo drew a walk to load the bases. Prince Fielder also walked, followed by Beltre’s infield single, a sacrifice fly by Mitch Moreland, and back-to-back hits by Josh Hamilton and Elvis Andrus to tag on six runs. It was the Rangers’ first division title in four years, and Choo’s first since he became a full-time player in 2008. Choo overcame a dismal first half of the season with an outstanding second half, giving the Rangers much-needed pop and on-base skills at the No. 2 spot in the order. Choo batted only .221 in the first half but .347 after the All-Star break. He led the MLB in hits, batting average and on-base percentage in September. He finished with 22 home runs, tying his career-high, with 82 RBIs, 94 runs scored and 76 walks. He had a line of .276/.375/.463. Choo will be making his second postseason appearance, after playing in the National League Wild Card Game for the Cincinnati Reds in 2013. The Rangers uncorked champagne in celebration inside the home club house, and the usually stoic Choo, smiling and soaking in the bubbly party, said he’s been waiting for this moment for a long time. Choo, who signed a seven-year deal with Texas before the 2014 season, said he is aware of the work that lies ahead. Choo is the only South Korean in this year’s postseason. Pittsburgh Pirates infielder Kang Jung-ho has been ruled out for the season with a leg injury, but the Bucs have won one of the NL’s two wild cards. Ryu Hyun-jin, a left-hander for the Los Angeles Dodgers, had to watch from the sidelines as his teammates celebrated their third straight NL West title, as he was ruled out for the season in May after undergoing a shoulder operation. The Blue Jays won the season series over the Rangers 4-2. In June, the Jays won two out of three at Rogers Centre. Two months later, Toronto also took two out of three, this time at Globe Life Park. Choo went 7-for-28 against Toronto with no home runs and two RBIs, including just 1-for-14 at Rogers Centre. He does have a strong history against the Jays’ likely Game 1 starter, David Price, having gone 6-for-19 (.316), albeit with seven strikeouts.